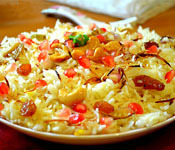 The Indian state Jammu and Kashmir is not only considered as a paradise for its travelers but also for its food lovers. This state serves a wide range of striking dishes and recipes. In 15th century AD, Timur invaded Kashmir. 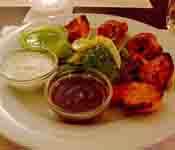 Also the cuisines of this state have a secret behind which reside in the history books. Hundreds of expert cooks traveled from Samarkand in order to supply to the regal tongue. The successors of these professional cooks presented the state with unsurpassable custom of Wazwan cuisine. This Wazwan cuisine is regarded as a delicious scented dinner of Kashmir as it consists of 36 course feast. Basically this meal’s meat base is organized by wazas who are known as cooks under the direction of Vasta Waza who is the head chef. Mainly the Kashmiri chefs prepare non-vegetarian cuisines. 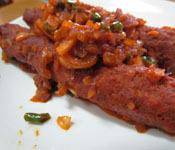 They prepare those dishes more that are meat based with beef as they are preferred more by the food lovers. Moreover condiments, spices and curd are used by the people in liberal form. Mustard oil is chiefly utilized as it is considered as an intermediate of cooking. Kashmir cuisine has another feature and that is the moderate amount of costly kesar or saffron. This Kesar is cultivated in the state as climate of this region helps in cultivation. The staple crop of Kashmir valley is rice. Kashmiri people are intense tea in takers. In Kashmiri idiom, the word "noon" states as Salt. The most accepted slurp is a salted tea which is pinkish colored and it is called as "noon chai." This tea is made with ingredients such as milk, green tea, and salt and soda bicarbonate. The exacting color of this tea is an outcome of its exclusive technique of groundwork and the accumulation of soda. The Kashmiri Pandits are extra frequently refer this tea or chai as "Sheer Chai." Sheer Chai or Noon Chai is a ordinary tea breakfast and it is majorly consumed in Kashmiri households. Also this tea is taken along with baqerkhani which is breads. This bread is brought clean from the bakers or Sufi. Qahwah or Kahwah is such kind of tea which is customary served at festivals, marriage feasts and religious places. This tea was originated since 14th-century from an Arab coffee and therefore it was named after an antique drink of the Sufis. This Sufi drink is made from green tea with spices, saffron and walnuts or almonds. Also this chai is recognized as "Maugal Chai" by few Kashmiri Pandits and nearby villages of it.